To request the services of KPU's Elder in Residence, please complete and submit the Elder in Residence Request Form. One of 20 Kwantlen First Nation Elders, Lekeyten grew up within a very large family in Chehalis First Nation near Harrison Lake. Here, Lekeyten attended day school. Similar to residential schools, day schools did not require students to stay overnight and they returned home at the end of every day. But the teachings were the same, said Lekeyten, and he and his classmates were taught to be quiet. As a result, Lekeyten spent more time in nature than in school, and he soon found his voice. Fast-forward to adulthood, and Lekeyten has been avidly involved for more than 20 years as a guest speaker and presenter at all levels of elementary, secondary and post-secondary education as well as trades and conferences in the Lower Mainland. His talks are about the environment, land and water use, fishing, and issues of conservation and its traditional importance. Lekeyten is a proud father of three daughters and two sons. He is also extremely proud of being a grandfather of nine. Lekeyten and his wife Cheryl Gabriel have been together for forty years. He loves and respects his family wholeheartedly. 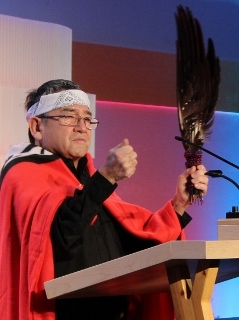 Lekeyten is honoured to be an Elder in Residence at KPU. He will share with the university, faculty, staff, and students the best of himself. He believes that every person deserves the best for their life and educational journey. Impart traditional knowledge, ceremonies, language, crafts, food/herbs, humour, etc. KPU welcomed its first Elder in Residence at a special installation ceremony January 29, 2015. The installation included warm remarks from many who have known and worked alongside Lekeyten. Former KPU anthropology instructor Laura Cooper spoke of her lengthy friendship with Lekeyten. She said he taught her how to be a better instructor and a better human being – the latter lessons he also shared with students. Speaking directly to Lekeyten, Cooper expressed her gratitude for teaching us all to be more humble and more compassionate. KPU criminology instructor Lisa Monchalin, who is of Algonquin, Metis and Huron descent, described Lekeyten as one of the most honest and intelligent people she’s ever met, and said KPU is honoured to have him as its first Elder in Residence. KPU Chancellor Dr. George Melville, officiating at the installation, said he’s confident Lekeyten will bring the best of himself to his role as KPU’s first Elder in Residence. Read the full KPU news release here. The Elder may choose to be called by a given first name or an ancestral name. Please ensure you ask them for their preference. In all cases, every effort must be made to ensure the correct and proper pronunciation of their first name or ancestral name. When meeting with an Elder it is customary to allow ample time. Under most circumstances the Elder will inform you of when the meeting is finished. In Coast Salish traditions, speakers cede the floor to the person sitting to the right of the first speaker. It is customary to ask an Elder to conduct a prayer at the beginning of any meeting or gathering. Where feasible and if the right person is available it is also appropriate to offer a song to commence the meeting or event. The Elder is always served first and eat first in events where food is prepared and offered to the gathering. Invitations to the Elder should be handled through the office of the Director, Student Engagement. Compensation is customarily presented to the Elder at the event, not afterward. Service beyond regularly scheduled time in the Aboriginal Gathering Place will be compensated accordingly. Compensation for engagements up to three hours is $120 per engagement. Compensation for engagements more than three hours up to a full workday is $40 per hour. Payment for additional service shall be borne by the department or unit issuing the invitation. Expenses or costs resulting from participation in KPU events must also be reimbursed to the Elder in addition to any honoraria (e.g. travel mileage). Monetary compensation for Elder services must be done in accordance with the policies of the University's financial services. Payment for special events outside of the Elder's normal service must be done by cheque and requisitioned with sufficient advance notice that payment will be available for the Elder on the date of the special event. Requests for receipt or other acknowledgement from the Elder of gifts or payment are not customary. Presentations of any gift or payment to the Elder must be witnessed by a University employee.